Melbourne Victory’s impressive performance was among the highlights of round 4 of the A-League, also known as the ‘Remembrance Round’. The champions comfortably defeated the Central Coast 4-1, creating a lot of chances and putting the pressure on their opponents. And it was thanks to this pressure that the first goal came, as after a poor forward pass from Golec, Keisuke Honda latched onto the ball and moved into the area to let it rest in the back of Kennedy’s net. Five minutes later, Terry Antonis chipped a clever pass into the area for James Troisi to double his team’s lead, while Corey Brown made it three in injury time. The Mariners got one back after a shot by McCormack that was tucked away by Shabow, but the show wasn’t over for Victory, as Swedish star Ola Toivonen marked his debut in the A-League with an assist toward Josh Hope, who closed the score of game. In Adelaide, United had the chances but Perth had the glory. The home team had great opportunities through Halloran and Greek youth Stamatelopoulos, yet the visitors punished them for their lack of accuracy on the 73rd minute after a corner kick was converted by Andy Keogh, who has now scored on all four of the opening games of the season for his team. 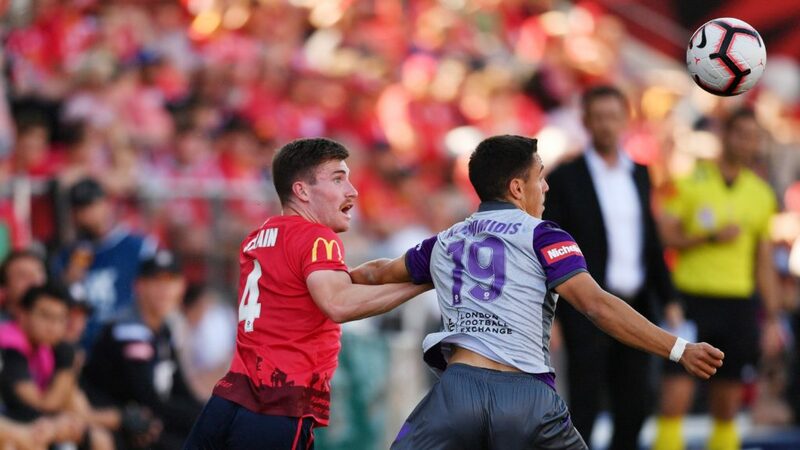 After a counter attack from Glory, Chris Ikonomidis came to settle the tie on the final minute. Meanwhile, Sydney FC maintain their unbeaten run but fell from first place as they were held to a 1-1 draw against the Jets. Alex Brosque managed to put the ‘sky blues’ in front but it was not meant to be as Newcastle found a late equaliser through Cowburn, forcing the match to a tie. The latter team from Melbourne, City were also successful in their attempt to try and return to winning form, as they comfortably overcame the Wellington Phoenix 2-0. Two goals in each half (one from Ritchie De Laet and one from Bruno Fornaroli) were enough to ensure the three points for Warren Joyce’s team. Before each of the games was played, there was an order of service held in honour of the soldiers of World War I, while all teams played with the red poppy on their jerseys. After these results, Perth Glory are in top position of the A-League with 10 points, with Sydney FC in second with eight and Melbourne City in third with seven. For the next round, Victory will travel to Sydney to face the “sky blues” while the Glory will welcome the Mariners.